Carissa is passionate about massage. She excels at discovering compensation patterns in the body and getting to the root of the issue, as well as resolving current, or chronic, issues that hold people back from enjoying a vibrant life. Her favorite aspect of care is client education, since this process puts the power of choice, action and outcome into the client’s hands. 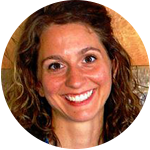 Her work includes helping people recover from injuries, accidents, chronic pain, surgery, and discussing how lifestyle and nutrition choices play key roles in body functions. Carissa uses a unique blend of massage modalities, posture reeducation activities and stress management coaching to help clients achieve their wellness goals. She also works closely with other health care providers, Pilates and yoga instructors and personal trainers to ensure optimal holistic care. Carissa graduated from East West College of Healing Arts in 1999. She practiced massage in Eugene for 10 years and relocated to Portland in 2010. Her specialties include pain relief for acute and chronic issues, Headaches, Pregnancy and Postpartum, Corporate Massage and Stress Management. When enjoying life outside of work, Carissa’s son is a constant source of joy and excitement. They hike, go camping and create LEGO masterpieces together. Gardening is her preferred medium for artistic expression. Another passion close to Carissa’s heart is creating a world that is a happier, healthier and more nurturing place for children. She believes everyone deserves the opportunity to reach their highest potential, which is why Carissa donates 10% of her company profits to organizations designed to bring children a brighter future.